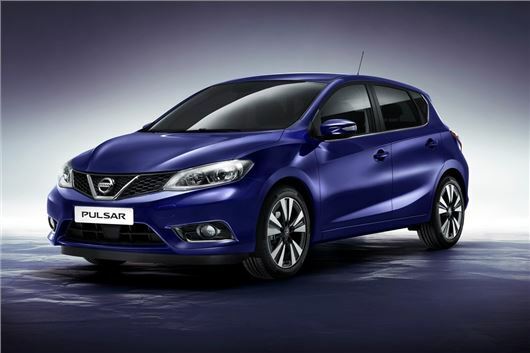 Prices for Nissan's new Pulsar will start at £15,995 when it arrives in the UK this autumn. The five-door family hatch will rival the Ford Focus and sees Nissan returning to the hatchback market after a prolonged absence. The entry-level model is powered by the 1.2 DIG-T petrol engine and comes in Visia trim. That gets air conditioning, a 5-inch colour screen, steering wheel mounted controls plus Bluetooth as standard. There are four different trim levels - Visia, Acenta, n-tec and Tekna with the Acenta adding dual-zone climate control, Forward Emergency Braking, rain sensing wipers, automatic lights the i-Key system. The n-tec trim adds LED lights, 17-inch alloys, privacy glass and a reversing camera. The top of the range Tekna is priced from £20,345 and includes leather seats, heated front seats, electric folding mirrors, Nissan Safety Shield systems including forward emergency braking, moving object detection, lane departure warning and a blind spot warning system. Initially two engines will be available, the 1.2 DIG-T with 115PS and 190Nm of torque plus a 1.5 dCi diesel with 110PS and 260Nm of torque. In early 2015 a 1.6-litre turbocharged engine will be added which has 190PS.